As spring makes its grand exit and summer is gradually making its entrance, the weather has a strong tendency toward the extremes. Whether it is heavy rain, high wind, strong sun, or extreme heat, there’s a lot to watch out for over the coming weeks. We want you to stay safe, so we’re bringing you safe driving tips to prepare you for driving in bad weather. One of the best things you can do to stay safe is to make sure your car’s tires are in good condition. Overly worn and under or over-inflated car tires can be dangerous on their own, but combined with hazardous road conditions or high temperatures they can be deadly. Before you leave home check the tread on your tires to make sure it is not too low or worn unevenly. This is especially important to do before leaving on long road trips where extensive wear on your tires could turn an OK tire into a dangerous one. You’ll also want to use a tire gauge to check for proper inflation. Over or under-inflated tires can prevent your tire tread from whisking away water from beneath the tire when driving in rain. If this happens, you run a much higher risk of hydroplaning. Also be sure to check your headlights and wiper blades. If bad weather comes up unexpectedly, it’s very important that both of these be ready for action. Be careful when driving in rain after prolonged dry spells. Oil and grease build up on the road and the addition of water, even a little drizzle, can make for slippery road surfaces. Keep your headlights on. A good rule of thumb is to use your headlights any time you run your windshield wipers. This ensures that other drivers can see you. It also greatly reduces the risk of you being involved in an accident. Stay away from high water. If you aren’t sure how deep the water is, don’t drive through it. During hard rains it is common to see some minor flooding and standing water on roadways. If you can take an alternate route, do so. 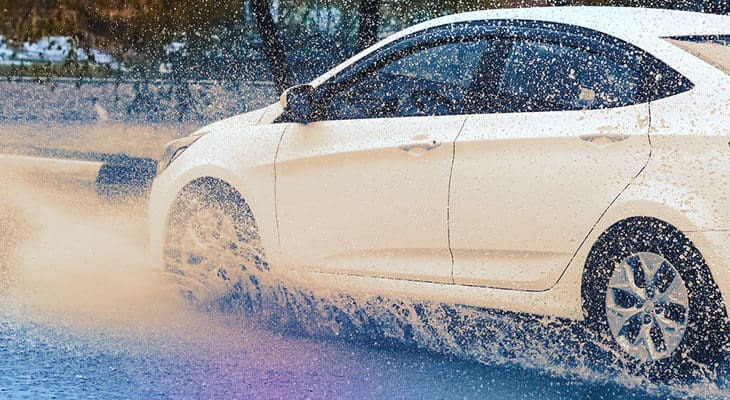 Regardless of what you are driving, it’s smart to avoid driving through standing or running water on the road. The best advice is to avoid driving in fog entirely. Fog usually dissipates with time, is constrained to specific areas where rapid temperature changes are common, and is generally avoidable. If you can, delay your trip. If you find yourself driving in fog unexpectedly, drive slowly. Use your fog lights if you have them and, if not, avoid using your high-beams. It is also a good idea to pull off the road and wait out the fog, leaving your car’s lights on to remain visible to other drivers. It’s not always bad weather that poses a threat on the road. It’s a good idea to employ some basic safe driving techniques to ensure your safety as well as the safety of others. Minimize distractions where possible. Don’t answer phone calls or texts while driving. Use turn signals, even if you don’t see other drivers on the road. Keep a safe following distance (Inadequate following distance is a major contributor to highway accidents). Always drive sober to avoid becoming a drunk driving statistic. Don’t speed. The faster you drive, the less time you have to react to other drivers and road conditions. The more time you have to respond, the safer you’ll be.